Bar/prep faucets go beyond the kitchen, to butler's pantries, morning kitchens and more. With Leland, traditional styling and modern functionality come together in dramatic fashion for a timeless look. The Delta-exclusive MagnaTite docking system keeps the spray wand securely in place for picture-perfect grace. Put water right at hand. Nobody offers a wider range of pull-out and pull-down kitchen faucets. Delta's exclusive DIAMOND(TM) Seal Technology uses a valve with a tough diamond coating to bring you a faucet built to last up to five million uses. Plus, it keeps water inside the faucet out of contact with potential metal contaminants. Who knew a faucet could be just as beautiful on the inside? Sleek design with the charm of simplicity. The arc of the Collins spout adds clearance for easy filling of pots and pans. Features DIAMOND Seal Technology. Arched spout for easy filling of pots and pans. Single handle for ease of control with one hand. Available in store by Special Order Only. See associate for details. Debonair Pull-out Kitchen Faucet, Stainless Steel Delta's exclusive DIAMOND Seal<sup></sup> Technology uses a valve with a tough diamond coating. InnoFlex<sup></sup> PEX waterways keep water inside the faucet out of contact with potential metal contaminants. This powerful combination brings you a faucet built to last up to five million uses. Only Delta faucets are equipped with Touch-Clean<sup></sup> soft, rubber nubbins that allow you to easily wipe away calcium and lime build-up with the touch of a finger. The included escutcheon completes the ensemble for a more finished look. 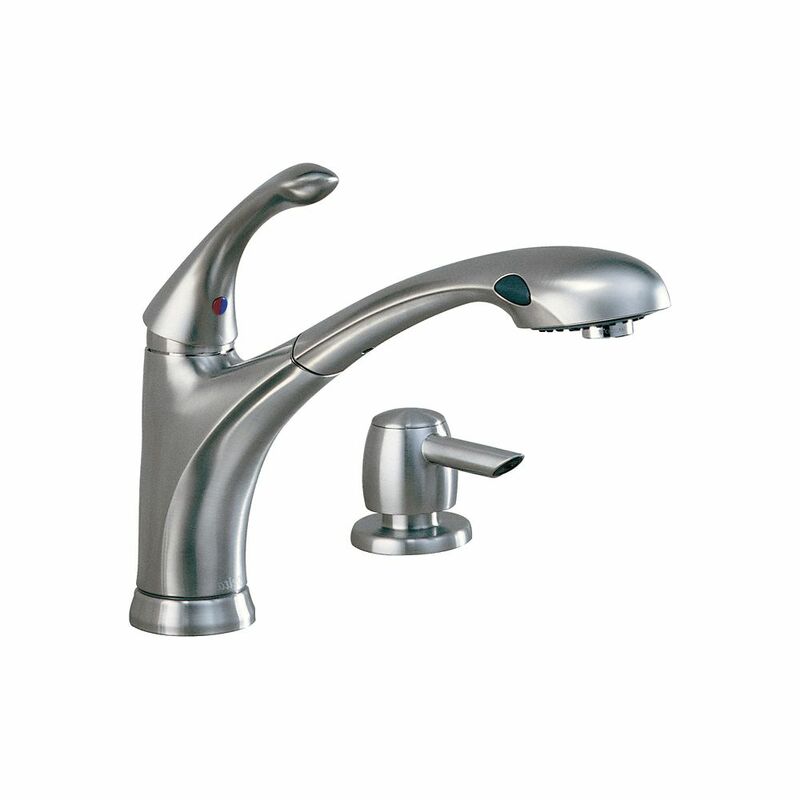 Debonair Pull-out Kitchen Faucet, Stainless Steel is rated 4.2 out of 5 by 70. Rated 5 out of 5 by Timothy from Wow Works great. Easy installation. Rated 5 out of 5 by Medic Phil from Love this faucet Bought this to replace one that was "for life", but died rather quickly. This design goes so well with our granite counter tops, love the pull-out feature and overall design. Was very easy to install, the old one was harder to get off than this was to put on. Rated 3 out of 5 by Jack75Skyline from Great Faucet but Valve Cartridge is a problem We bought this faucet in 2014 and were very happy with it at the beginning but in 2017 it was dripping. I replaced the valve cartridge & used a genuine Delta replacement part ($35). Now, less than two years later, I need to replace the cartridge again! This component doesn't seem too robust! Rated 5 out of 5 by Dee in Atlanta from So far so good! I just had this faucet installed. I love the look and simplicity. I searched all over town for a basic, good quality faucet with a warranty. And I didn't want to spend a fortune on an overrated pull down model. I am a little nervous because some customers have complained of leaks. I chose Delta over Moen, so I am praying I won't have a problem. And if I do, I hope Delta stands by their word and replaces this product. Fingers crossed!! Rated 5 out of 5 by S Hall from Perfect!!! I bought this faucet for my new home and I absolutely love it!